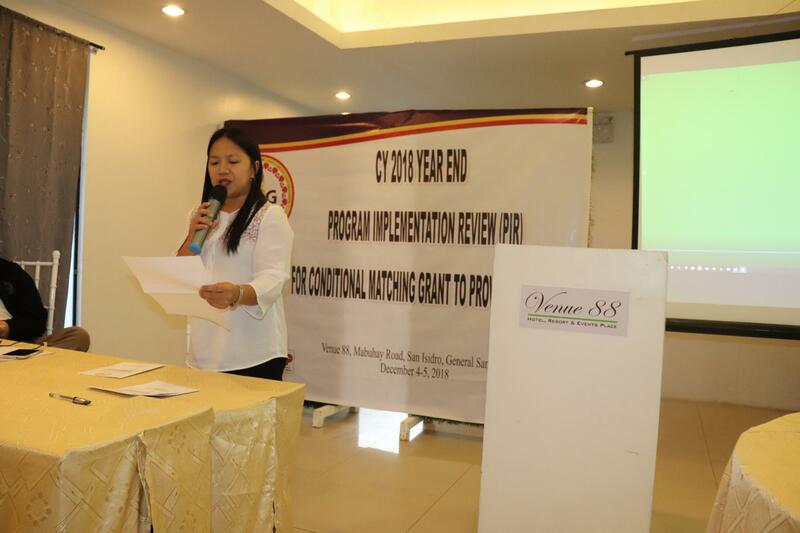 The DILG XII recently conducted the CY 2018 Year end Program Implementation Review for Conditional Matching Grant to Provinces at General Santos City. The activity was participated in by the Provincial Engineers, Provincial Accountants and Provincial Planning Officers. Engr Ananias “Bong” Fernandez, CMGP-PMO Assistant Program Manager of DILG Central Office presented the budget allotted for CY 2019. He emphasized that the allocation of the budget depends on the performance of the provinces in terms of project implementation. He likewise presented the FY 2018 CMGP Fund Utilization and Project Implementation Status. He then reminded the provinces of the status of their respective Provincial Governance Reform Roadmap (PGRR). On the first day of the activity, the provinces were given the opportunity to share their best practices in terms of implementing the 2018 CMGP Program. On the last day, a workshop was conducted which focused on identifying the gaps, gains, incidences and the facilitating factors that will address the gaps encountered by the LGUs in project implementation. All provinces presented their outputs to Engr. Bong Fernandez.